Thousands march as part of Rally for the Rail protest ← Save Our Rail NSW Inc. The people have spoken. Thousands of residents marched on Civic Park to protest the truncation of the rail line into Newcastle. Links to media articles and videos below. Hunter commuters say they will not give up in their fight against the New South Wales Government’s planned truncation of Newcastle’s rail line, due to go ahead on Boxing Day. Around 2,000 people gathered in Newcastle for today’s ‘Rally For The Rail’ protest, with many chanting “truncation is a great big fail, keep your hands off our rail”. The government recently approved its plans for a transport interchange at Wickham, and intends to begin the line’s truncation on December 26. Organiser Dave Blythe said 16 community groups joined forces to take a stand against an alleged abuse of a public asset. “We shall not give up the fight, we have only started,” he said. ‘Save Our Rail’ president Joan Dawson has been lobbying to retain the line for nearly 12 years and said the fight will not be over on December 26. “Because we believe that what they’re doing is illegal, and we will be pursuing that as a legal issue,” she said. “Many politicians have come and gone, but Save Our Rail will prevail. Read the full article at ABC News Newcastle. People from Maitland and the Upper Hunter joined others from Lake Macquarie and Newcastle at the beginning of the Rally for the Rail in Pacific Park on Sunday morning. Save Our Rail president and Dungog resident Joan Dawson addressed up to 3000 people at the rally after the crowd marched down Hunter Street to Civic Park. Protesters chanted slogans and waved banners to show their anger at the state government’s determination to cut the rail line at Wickham on Boxing Day. Mrs Dawson told the protesters Save Our Rail would organise direct action if necessary. “This decision to cut the rail line has not been made with due process,” she said. “There has not been consultation with the community or the original owners of this land. “If they do manage to close the rail line on Boxing Day, we are endeavouring to use every legal means necessary to stop the chop. Read the full article, with photos and videos, at the Maitland Mercury. CIVIC Park filled with a chanting crowd at the Rally for the Rail on Sunday, with police estimating about 2000 calling for the Boxing Day truncation to be called off. Just weeks ahead of the Boxing Day truncation date, Newcastle lord mayor Nuatali Nelmes told the crowd she was a proud representative of the council trying to protect Newcastle’s east end. Earlier Save Our Rail president Joan Dawson told the crowd her group’s support of retaining the rail line will continue even if it is cut, while Newcastle Trades Hall’s Daniel Wallace said “we’ll make sure they don’t cut the rail line”. Cries of “Save our rail, save our city” and the direct “Don’t cut the rail” echoed through Newcastle’s east end as protesters marched against the impending rail truncation, closing streets as they passed. 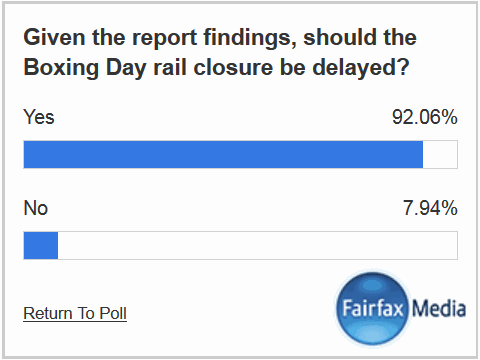 Those in favour of saving Newcastle’s rail line staged a mass rally today, vowing to continue protesting, even if the truncation goes ahead on Boxing Day. Watch the new video clip at NBN News website.